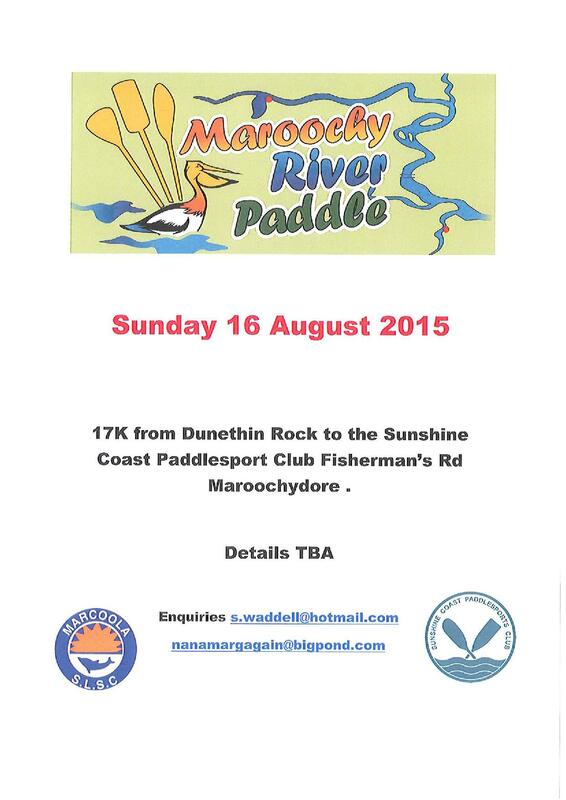 The Maroochy River Paddle is a marathon paddling race on the Maroochy River starting upstream at the Dunethin Rock Scout Camp and travelling downstream with the out-going tide to finish 17 K later in Eudlo Creek at the Sunshine Coast Paddlesports Club. The MRP is held annually to celebrate all paddle sports on the Sunshine Coast and the beauty of the Maroochy River. The full range of paddle sports is represented: Racing Kayaks, Sea Kayaks and Fishing Kayaks; Dragon Boats and Outrigger Canoes; Surf Spec SKIs and Ocean Racing SKIs; Stand-Up Paddle Boards; Canadian canoe; Plastic sit-on-top and anything else you might wish to paddle. The race is the joint effort of the Sunshine Coast Paddlesports Club and the Marcoola SLSC.